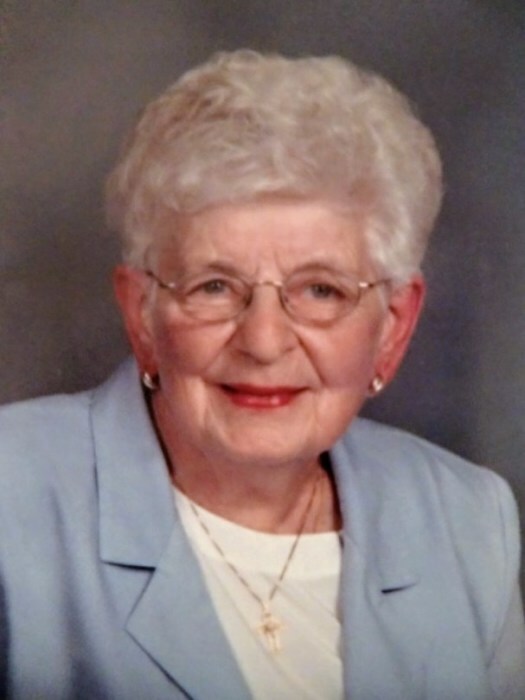 Obituary for Mary M. (Livrone) Mirandola | Clawson Funeral & Cremation Center, Inc.
Mary Mirandola, 96, of Snellville, Ga., formerly of Leechburg, passed away peacefully Tuesday, April 2, 2019. She was born Feb. 15, 1923, in Leechburg, to Martina (Antoniono) and Pasquale Livrone. A proud graduate of Leechburg High School's class of 1941, she married Ernest Mirandola at Scott Airfield Base in Belleville, Ill., in 1944. She raised her family in Kiskimere, then in Allegheny Township, and lived in Hyde Park before moving into assisted living in 2015, first in Meadville, Pa., then in Snellville, Ga. During World War II, Mary rolled up her sleeves, as many women did at the time, and worked at a Cleveland factory. Later, she worked at the Schenley Distillery in Leechburg, the Penn Grill Restaurant and in the Kiski Area High School cafeteria. She was no stranger to hard work, and she valued education, taking great pride in raising a nurse, a teacher and an attorney. Mary was a member of St. Catherine's Roman Catholic Church, then Christ the King Parish, and most recently St. Lawrence Parish in Lawrenceville, Ga. She cherished lasting friendships and truly cared about others. She was proud to call Leechburg home throughout most of her life, and was involved in many community groups, including the Marconi Ladies Auxiliary and the Allegheny Township Auxiliary. Her interests in life were as wide as her smile. She enjoyed bocce, cooking, traveling, playing cards and Scrabble, crocheting, reading, and above all else, spending time with her family and her many friends. Her family will miss her warmth, her wit and her ravioli. Mary was the last of her Livrone generation. She was preceded in death by her parents; her siblings, Peter Livrone, Marguerite Livrone Brosing and Domitilla "Tillie" Livrone Trozzi; brother-in-law, Victor Trozzi; and her loving husband, Ernest; as well as her son-in-law, John Ziacik; her grandson, Dominic Slezickey; and many aunts, uncles and cousins. The matriarch of her family, Mary is survived by three daughters, Ernestine Ziacik, of Homosassa, Fla., Denise Mirandola (Ron Veronese), of Holden Beach, N.C., and Loretta Mirandola (Tim Mullen), of Lawrenceville, Ga.; and nephew, Ron Trozzi (Laurie Blitz), of Columbia, Md. She is also survived by her nine grandchildren, Terri, Shelley, David, Dannielle, Dustin, Annie, Martina, Jacqueline and Alexandra; and her seven great-grandchildren, Cash, Mattie, Dominic, Andrew, Luca, Devin and Delaney. Calling hours will be from 6 to 8 p.m. on Thursday, April 11, at Clawson Funeral & Cremation Center, 170 Main St., Leechburg (724-842-1051). Parting Prayers of Transfer will be held at 9:15 a.m. on Friday, April 12, at the funeral home, followed by Mass of Christian Burial at 10 a.m. at Christ the King Parish, 125 Park Road, Gilpin Twp., with the Rev. James H. Loew, O.S.B. officiating. Interment following at St. Catherine Cemetery, 614 Evergreen Road, Gilpin Twp. In lieu of flowers, donations can be made to the American Heart Association.